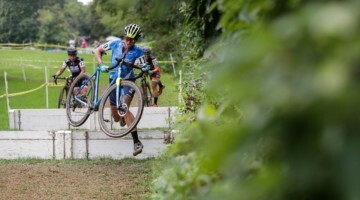 While Kemmerer found success for the first time, newlywed Wes Schempf (C3-Athletes Serving Athletes) came into the race as the defending series champion and two-time race winner. The two races couldn’t have been more different. 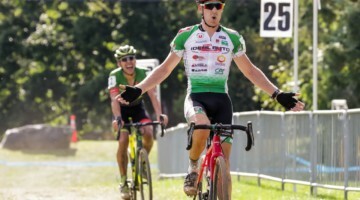 Where Kemmerer took a huge solo win, Schempf waged a race long duel with Joe Dombroski (Haymarket Bicycles/Trakkers) that came down to a sprint that was decided in the final few meters. Soon after the start, Schempf and Dombroski, along with Schempf’s teammate “Bad” Andy Wulfkuhle and Dombroski’s teammate Jared Nieters pulled away from the rest of the field. Wulfkuhle was the first to drop off the lead group, giving the Haymarket team a two-on-one advantage. Then Nieters, who was racing with strained ligaments in his left knee, succumbed to the effort required on the heavy surface and started to fall back. This forced Schempf to lead as he couldn’t risk Nieters catching back up to assist the surprisingly strong 18 year old Dombroski. When the leaders came back into view, the situation had flip-flopped as it was now Wulfkuhle in third and on the charge, forcing Dombroski to lead. Eventually, both Wulfkuhle and Nieters, who finished third and fourth, respectively, dropped back out of sight and it was a one-on-one duel for the remainder of the race. The heavy surface completely changed the complexion of many of the races throughout the day, but none more than the tactics in Elite Men’s race, which is usually decided by an attack and a long chase with two or three laps remaining. “With the heavy soil, you just couldn’t get away,” said Dombroski afterwards. Schempf agreed, “With this heavy surface, there was no way I could go long. I tried a couple of seated accelerations, but Joe covered those pretty easily. He attacked on the final climb up the power line hill and that hurt, so props to him. But I was able to cover it.” With both racers together after the last major obstacle, the race came down to a man-on-man road sprint. Dombroski led through the chicanes and the 90 degree gravel corner around the Lillypons store 75 meters from the finish. Dombroski looked over his left shoulder just as Schempf pulled up on his right. Dombroski tried to squeeze Schempf, but pulled his left foot out of the pedal, giving Schempf his third Ed Sander Memorial Elite victory. 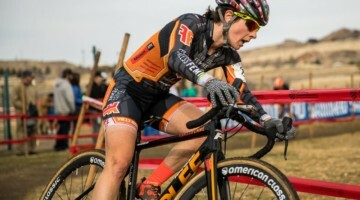 The BikeReg.com MABRAcross Series continues with a two-race weekend on October 3 and 4. 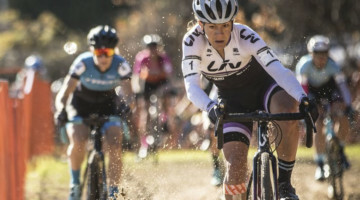 The traditional Breast Cancer Awareness Cyclocross kicks-off world-wide Breast Cancer Awareness month with a race at the Hagerstown, Maryland Fairgrounds on Saturday, October 3. 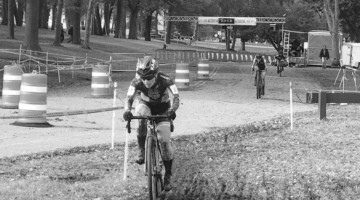 The following day, the MABRA series will move down the road a few miles for the Kelley Acres Cyclocross in Middletown, Maryland. Information for these and all races in the BikeReg.com MABRAcross Series can be found at www.BikeReg.com.